Urethral stricture may be due to many causes, the majority of which include iatrogenic causes (transurethral resection, urethral catheterization, cystoscopy, prostatectomy, brachytherapy, and hypospadias surgery). Rarely, urethral tumor in males may present with obstructive urinary symptoms, and the common malignancies of the anterior urethra are squamous cell carcinoma and urothelial carcinoma. Extraosseous giant-cell tumors (GCTs) are rare entities. These tumors have been described in the skin, soft tissues, breast, heart, kidney, colon, thyroid, larynx, urinary bladder, and breast. The etiopathogenesis is controversial and largely remains unexplained. Herein, we report an unsuspected case of primary GCT of the urethra, an extremely unusual entity, which, to the best of our knowledge, has not been described till date. 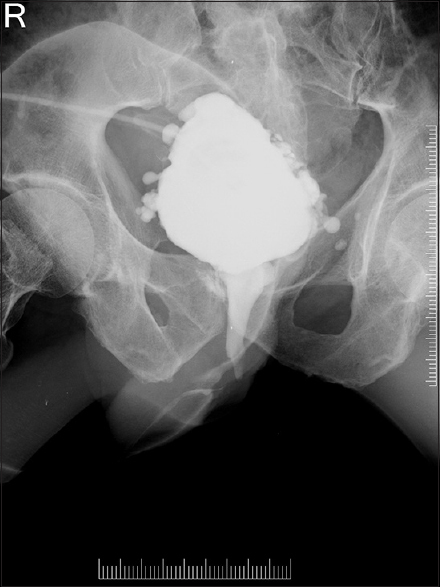 A 75-year-old male without any comorbidity presented with complaints of poor urinary stream and dribbling. On examination, the urinary bladder was partially filled (palpable), meatus appeared normal, and spongiofibrosis was present in the bulbar urethra. The patient was planned for further workup, suprapubic cystostomy, and later on, definitive surgery in the form of substitution urethroplasty. Routine investigations were within normal limits. Retrograde urethrogram and micturating cystourethrogram were suggestive of a narrow caliber penile urethra with relatively small capacity, chronically obstructed bladder outlet with multiple diverticulae of the urinary bladder, and a stricture at the distal bulbar urethra [Figure 1] and [Figure 2]. In the past, the patient had undergone transurethral resection of the prostate (TURP) 5 years ago, followed by optical internal urethrotomy 6 times in the past 4 years. Intraoperatively, urethroscopy showed the penile urethra of good caliber, with a pinpoint opening in the distal urethra. However, the mucosa was not healthy. Antegrade cystoscopy showed multiple diverticulae in the bladder, wide-open bladder neck, with post-TURP changes, and the verumontanum was visualized. Urethroplasty was started with midline perineal incision. On the right side of the distal bulbar urethral region, there was a firm growth involving the urethra, for which tissue was sent for frozen section, which showed a tumor in the urethral wall. Anterior urethrectomy, including removal of the proximal part of the right crura and perineal urethrostomy, was performed. Initially, a small tissue piece measuring 1 cm × 0.5 cm × 0.5 cm was received for intraoperative frozen section. The intraoperative frozen sections showed the urethral wall muscle involved by a tumor, following which the distal urethrectomy was done and sent for histopathological evaluation. A specimen of the urethra measuring 11.5 cm in length was received. An attached soft-tissue mass measuring 5 cm × 3.5 cm × 3 cm was seen at the proximal part of the urethra. The mass was gray white, firm, with focal hard areas, and involving the urethral wall [Figure 3]. The external urethral meatus appeared unremarkable. Microscopic examination showed an infiltrating tumor in the wall of the urethra, composed of nodules and small nests of predominantly numerous multinucleated osteoclast-type giant cells admixed with a few mildly pleomorphic spindled to plump cells with ill-defined cell borders. The mononuclear cells contained moderate amounts of cytoplasm, elongated nuclei with fine chromatin, and inconspicuous nucleoli. The giant cells contained moderate-to-abundant amounts of eosinophilic cytoplasm and 3–25 nuclei. No significant atypia was noted in the mononuclear cells or the giant cells. Metaplastic bone formation was noted within the tumor. Mitoses were <1/10HPF. 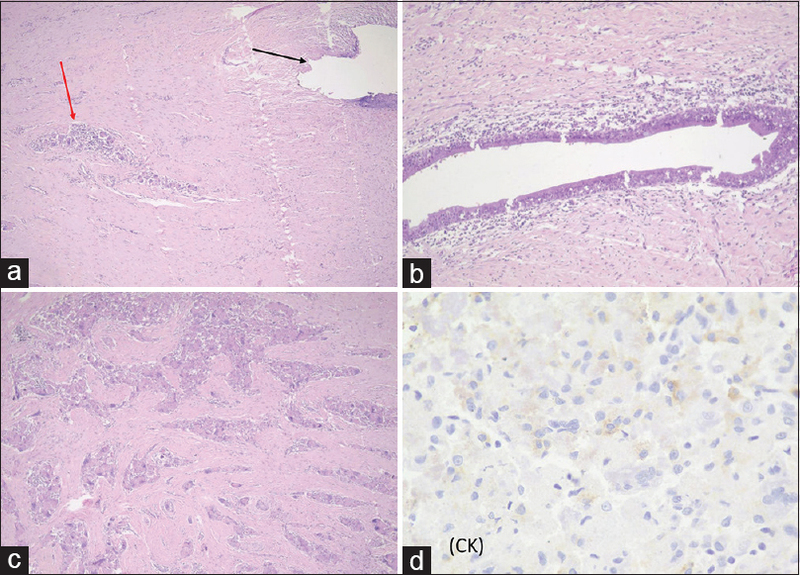 The tumor cells were closely associated with blood vessels, and vascular invasion was identified [Figure 1]b,[Figure 1]c,[Figure 1]d. The proximal and distal urethral margins were free of tumor. The urothelial lining appeared unremarkable. No epithelial/carcinomatous component was identified morphologically. The urothelial lining did not show any dysplasia [Figure 4]b. 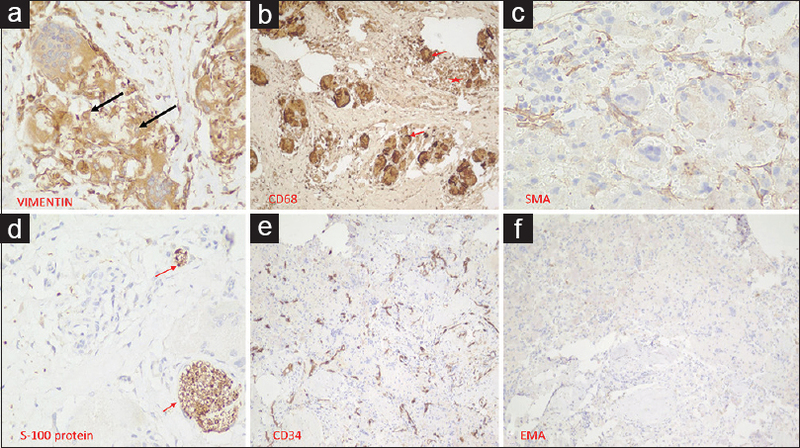 On immunohistochemistry, the tumor cells were positive for vimentin and CD68. The tumor cells were negative for smooth muscle actin, S100 protein, CD34, desmin, and myogenin. Epithelial membrane antigen [Figure 5] and cytokeratin [Figure 4] were also negative in the tumor cells, confirming the absence of epithelial differentiation. The morphologic and immunohistochemistry features were consistent with GCT. In follow-up, the patient voided well and was referred to the oncology department for further management. 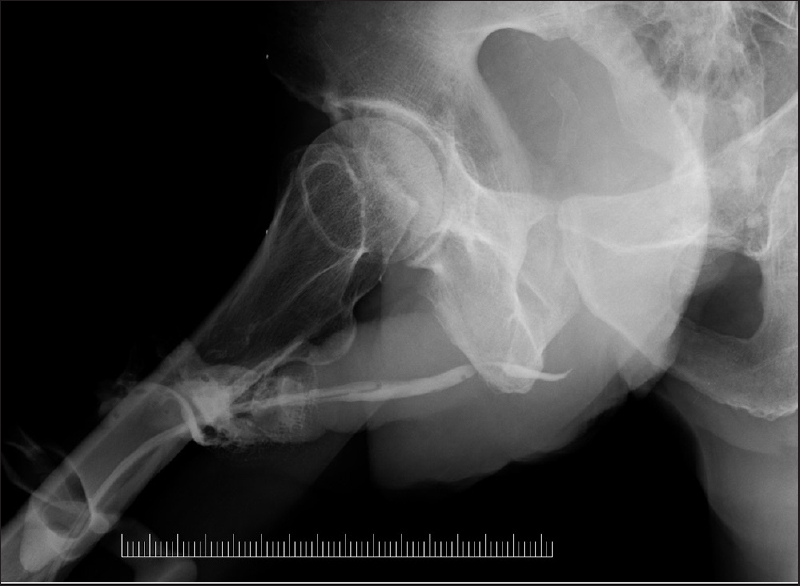 No swelling was detected around the joints (ruling GCT of bones, which is epiphyseal in location) or in the peripheral soft tissues (ruling out GCT of soft tissue). The chest X-ray and ultrasonography abdomen were unremarkable (ruling out deep/visceral GCT). A detailed history was taken, and general physical examination was performed to rule out GCT of rare sites. Extraosseous GCT is a rare tumor which has been reported in the skin, soft tissues, breast, heart, kidney, colon, thyroid, larynx, urinary bladder, and breast. To the best of our knowledge, GCT of the urethra is an undocumented entity. In the urinary tract, GCT has been reported in the urinary bladder, with a few reported cases showing synchronous epithelial tumors, including osteoclast-rich undifferentiated carcinomas of the urinary tract.,,, Aggressive behavior leading to death was noted in a case of osteoclast-rich undifferentiated carcinoma. However, the present case was a pure GCT, with no epithelial component. The morphological and immunohistochemical features were similar to GCT described in the soft tissue, including the architectural patterns, the admixture of mononuclear cells and osteoclast-like giant cells, metaplastic bone formation, vascular invasion, and positivity for CD68 and vimentin. Despite the lack of nuclear atypia, vascular invasion is noted in almost half of the cases of GCT of soft tissue, as was seen in the present case. Metaplastic bone formation is also seen in around 40% of the GCTs of soft tissues. Moreover, the immunophenotypic profile is similar to GCT of bone. The differential diagnoses include undifferentiated pleomorphic sarcoma, osteoclast-rich undifferentiated carcinomas, and plexiform fibrohistiocytic tumor. The mononuclear cells and the giant cells exhibit significant nuclear atypia in undifferentiated pleomorphic sarcoma. There was no atypia in the mononuclear cells or the giant cells in the present case. Osteoclast-rich undifferentiated carcinomas show a carcinomatous component, which was not seen in the current case. Plexiform fibrohistiocytic tumor is distinguished from GCT by a distinct dual population of cells, mononuclear cells, and giant cells, in the latter. The absence of atypia, the lack of carcinomatous component, the presence of giant cells, and the typical morphology of the tumor, aided by immunohistochemistry, helped in reaching the diagnosis. The etiopathogenesis of GCT is controversial and mostly unexplained. Possible hypotheses include spontaneous transformation of benign stromal cells and altered blood supply after surgery or radiation, which leads to recruitment of circulating monocytes, and that the accumulation of osteoclasts in these giant-cell-rich tumors occurs by receptor activator for nuclear factor-kappa B ligand-dependent process. However, the exact etiology remains a mystery. Since GCT of the urethra has not been described till date, the clinical behavior is uncertain. The low mitotic count, proliferation index, and circumscription indicate a low malignant potential; however, vascular invasion was noted in the tumor. We report, probably, the first case of GCT of the urethra, which should be kept in the differential diagnosis of urethral tumors and uncommon causes of urethral strictures. Due to its rarity, the clinical behavior is uncertain. Lumen N, Hoebeke P, Willemsen P, De Troyer B, Pieters R, Oosterlinck W, et al. Etiology of urethral stricture disease in the 21st century. J Urol 2009;182:983-7. Hoang MP, Rogers BB, Albores-Saavedra J. 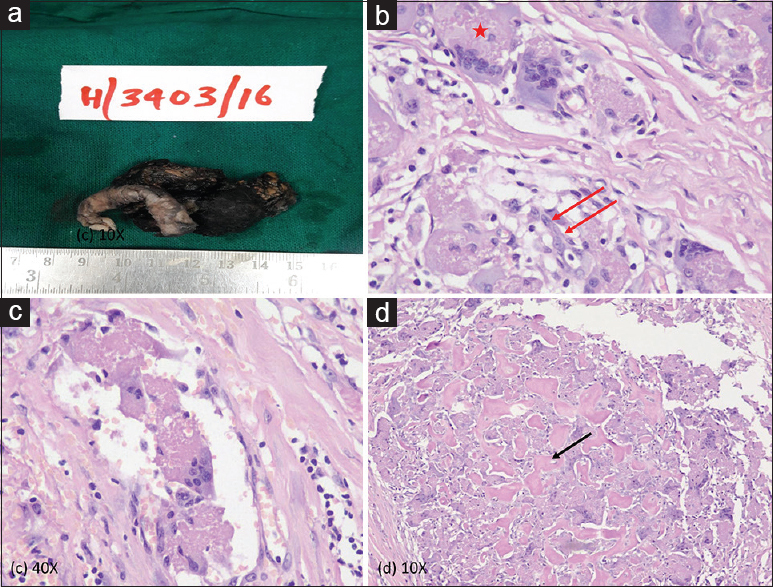 Giant cell tumor of the skin: A morphologic and immunohistochemical study of five cases. Ann Diagn Pathol 2002;6:288-93. Amir G, Rosenmann E. Osteoclast-like giant cell tumour of the urinary bladder. Histopathology 1990;17:413-8. Kitazawa M, Kobayashi H, Ohnishi Y, Kimura K, Sakurai S, Sekine S, et al. Giant cell tumor of the bladder associated with transitional cell carcinoma. J Urol 1985;133:472-5. Behzatoǧlu K, Durak H, Canberk S, Aydin O, Huq GE, Oznur M, et al. Giant cell tumor-like lesion of the urinary bladder: A report of two cases and literature review; giant cell tumor or undifferentiated carcinoma? Diagn Pathol 2009;4:48. Baydar D, Amin MB, Epstein JI. Osteoclast-rich undifferentiated carcinomas of the urinary tract. Mod Pathol 2006;19:161-71. Oliveira AM, Dei Tos AP, Fletcher CD, Nascimento AG. Primary giant cell tumor of soft tissues: A study of 22 cases. Am J Surg Pathol 2000;24:248-56. Lau YS, Sabokbar A, Gibbons CL, Giele H, Athanasou N. Phenotypic and molecular studies of giant-cell tumors of bone and soft tissue. Hum Pathol 2005;36:945-54.